These days, we just don't get any decent graffiti. True, some of these murals look quite colourful, but no-one seems to put any effort into careful lettering any more. 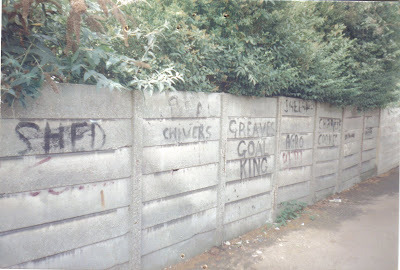 As a reminder of a much gentler and careful time, have a look at some graffiti penned on a wall in an alleyway in North Cheam during the late 60s/early 70s perhaps and which survived until the new millennium. Marvel at the careful sign writing. Sadly, the owner of this wall decided to paint it all over. The wall is now covered in tags, for fresh paint creates a better surface for marker pens, and the graffiti is lost.